At first glance it’s just an ES-140 with a PAF instead of a P90. But look closer and you’ll see about a dozen upgrades. In an earlier post, I wrote about the diminutive ES-140. You can find that here. They are fun little guitars, great for travel and far from being some toy. They were, however, fairly low priced “student” grade guitars. They were also popular with women who didn’t want to wrestle a huge ES-175 or other big guitar. None of the manufacturers were making a high end short scale or “3/4” guitar. 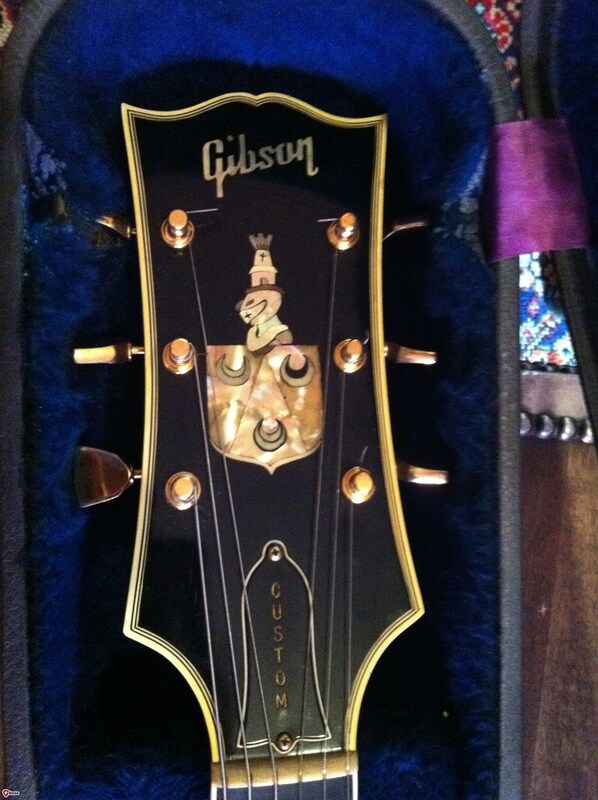 Gibson made the ES-140 and 3/4 size Les Paul Jrs, ES-125’s and the occasional Les Paul Special (I’ve seen one). Fender had the Duo Sonic and Musicmaster (and later, the short scale Mustang). The other big makers had similar choices but nobody made anything that approached a pro players guitar. Enter this little unit. 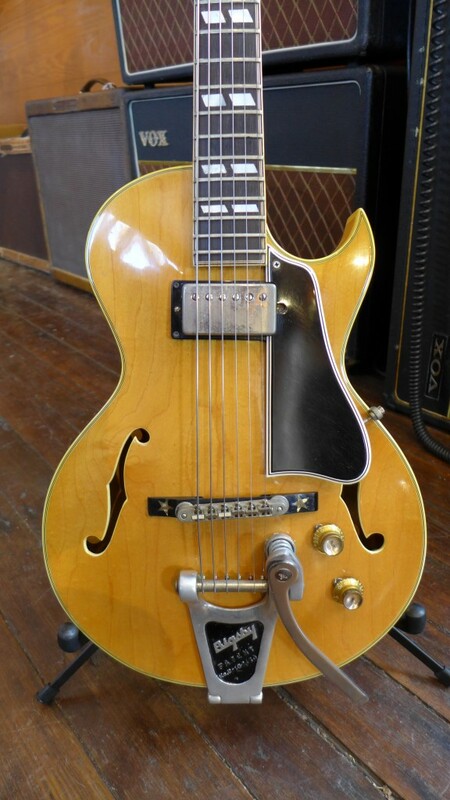 Clearly, a custom order, this 1961 ES-140 looks like somebody shrunk a blonde single pickup ES-350 or 175. While the stock ES-140 had a P90, this one has a PAF. The neck on a stock 140 was unbound mahogany. This one has a three piece flame maple neck with fancy multi ply binding like a Byrdland. The body on a stock 140 has single ply binding. This one has multi ply binding on the body like a 345 (front and back unlike a 345) and the same fancy parallelogram fret markers except that these are real mother of pearl as opposed to celluloid. But wait. There’s more. Check out the star inlays on the bridge base. Pretty cool and definitely custom. Factory Grovers, upgrade headstock overlay and a multi-ply guard as opposed to the single layer tortoise guard on the stock version. Did I mention the bound f-holes? Somebody really wanted a very special little guitar. Is that the Pope? Sure looks like his hat. Back in the 60’s, the Gibson folks were very accommodating to professional musicians and well heeled players. They would make you just about anything you could think of. There are, as you’ve probably seen, ES-355’s with the players name inlaid on the fingerboard, snazzy headstock inlays including one that looks suspiciously like the Pope. While Gibson maintains a “custom shop”, they don’t really do true customs there as far as I know. I looked at the Gibson web site and saw no mention of the kind of custom work they did back in the day. They do the “artist” models and a lot of the reissues but it really seems like an excuse to charge more for what is simply a slightly upmarket guitar. Maybe it’s more a factor of the artists not wanting to be quite so ostentatious these days, although I rather doubt it. I’m a huge fan of custom guitars-it speaks to the history of the instrument and of the artist. There are a pretty fair number of custom inlaid guitars out there with the names of some pretty obscure (mostly country) artists. You just don’t see that very much these days. And more’s the pity. I like personalized guitars. They carry their provenance with them forever and, in a small way, immortalize the original owner. Elvis had one but he didn’t need an inlaid fingerboard to become immortal. I don’t know who JS Peterson was but he thought enough of himself to have his guitar do the job of immortalizing him (on an admittedly small scale). That’s the Pope headstock inlay. Sorry it;’s a fuzzy picture. JS Peterson-a name that will live on for as long as somebody is playing this guitar. The Custom Shop really was a custom shop back then. That looks like a 64 ES-355. The little custom touches are cool…still, not many would like to own a guitar with someone else’s name in the fingerboard unless it said “Elvis”, etc..! That’s a really cool guitar and I am a sucker for short scale necks that are much easier for me to play with my small hands. Not sure if its in the twenty grand coolness range, though. Great player and, no, not twenty grand but one of a kind guitars kind of have their own market and they don’t always follow the rules. 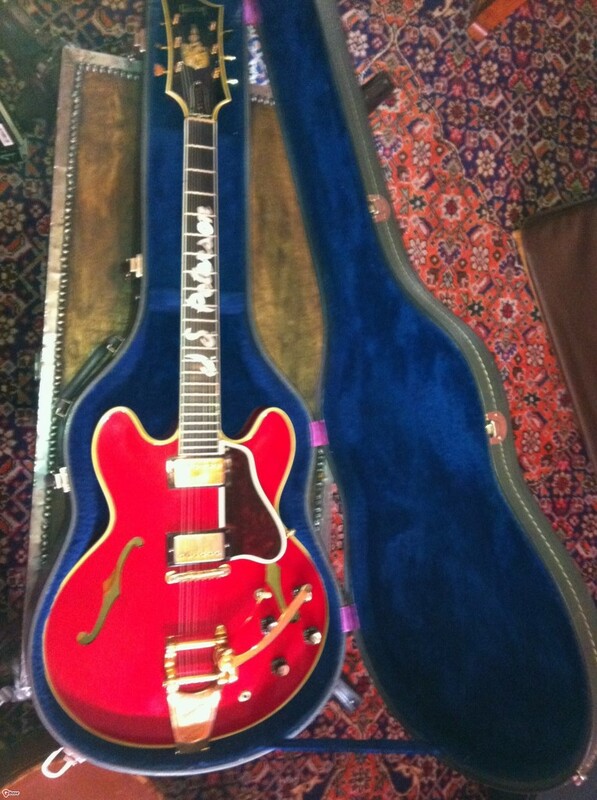 I did buy this one for a collector who has every type of ES-140 ever made. Now I need to find him red one. I had a ’57 ES-140T and if was a lot of fun to play…even gigged it once! That 140 is a lovely little thing. Funnily enough I was thinking about that Peterson 355 while I was reading as I was almost tempted by it when I was looking for one and it was for sale, couldn’t get over the inlay though! 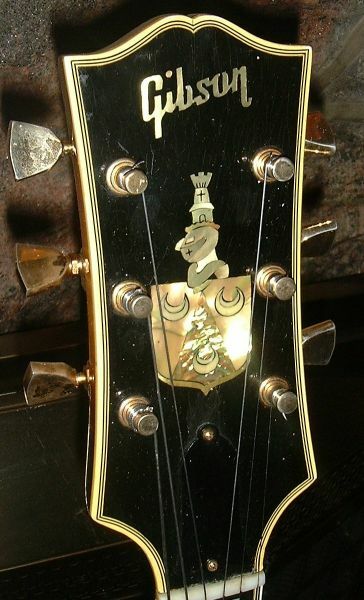 That “Pope” inlay looks like a knights helmet with a tower decoration above a three moon crest to me. Here’s the same inlay on a ’61 Birdland. I am considering purchasing a local Gibson that is for sale, but I am completely stumped. It too looks like an ES-140 but has many upgrades. Full-scale bound neck, bound f-holes, fancy headstock. 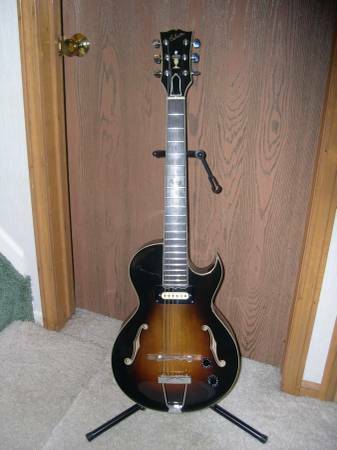 Is this legitimate, or some Frankenstein guitar? Hard to tell. I’ve seen custom ES-140’s before so a non conforming example doesn’t set off any alarms. Never seen a full scale though. That doesn’t look like a Gibson headstock overlay. Could be re-necked with a custom headstock overlay.